It's been fascinating to read the Book of Mormon in a relatively fast manner. It's allowed me to grasp things through different glasses. There's a section in Mosiah and into Alma where there's a bit of a "flashback", where so many different stories are told quite quickly, and it's often been hard for me to keep them straight. I hope to record on here some notes to keep the stories a bit more clear in my mind. One thing I caught yesterday in Mosiah 7:3 was the description about Ammon. Often when we take lazy perspectives on the Book of Mormon, we just assume that most of the main characters are descendants of Lehi, and then Nephi as well. They're all lumped into the label "Nephites" for general reference. In regards to Ammon, we learn that he is "a descendant of Zarahemla" –a Mulekite. For the reference chain on this, read Mosiah 7:3, Omni 1:14-15, and Mosiah 25:2. (If you click on Mos. 7:3, there's a hyperlink that'll lead you to Omni, then to Mosiah. Cool!) That means he was a descendant of Mulek, son of Zedekiah, king of Judah. He was not of the descent of the family of Lehi. 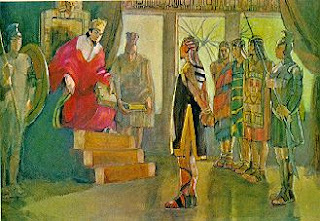 Ammon and about 40 others, to include his three brothers, were sent to find the people of Zeniff, who left Zarahemla about 79 years prior to settle in the land of Lehi-Nephi. When they encountered Limhi and his guards, they (Ammon & bros.) were taken, bound, and imprisoned for several days. Upon giving an opportunity to speak with Limhi again, they all basically get reintroduced. We learn of Limhi's background, but *thus far* there is nothing spoken to say if he's a Nephite or Mulekite. I'm excited to read the account that was kept from Zeniff down to Limhi, and learn more about what went on!